Earlier this month we showed you pictures of the inauguration from space, giving all of us an idea just how massive the crowds were on the National Mall. Now, we're going the complete opposite direction. A photographer at the inauguration used a special camera technology called GigaPan that allows you to zoom in on individual faces in the crowd and see the expressions on their faces. Photog David Bergman captured the image while working the inauguration for Corbis, an image company. By taking a series of overlapping images in a grid, Bergman was able to capture an incredible amount of detail. 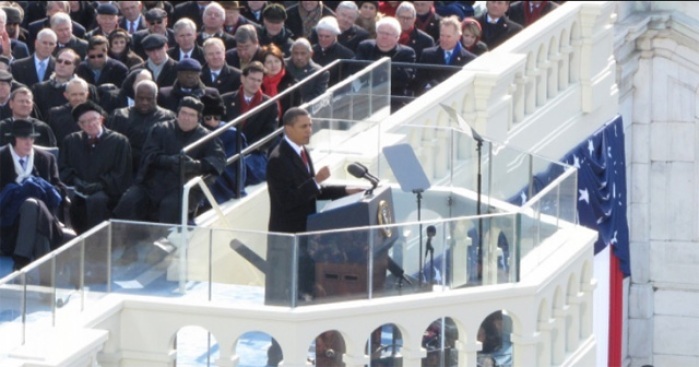 The result was a photograph that allows people to zoom in and view individual people, from Barack Obama delivering his speech to two people watching from the window of a building across the Mall. Click here to see the picture. "Supreme Court Justice Clarence Thomas is not sleeping. President Bush is not sending a text message. Yes, Oprah Winfrey is blocked by a camera tower. We’re still looking for Waldo." Bergman said on his blog that the amazing picture almost never happened. "I knew that I wanted to make a wide, panoramic shot of the crowd in addition to my traditional coverage," he said. "I brought the GigaPan Epic with me to D.C., but really didn’t know if I had room to carry more gear. At the last minute, I decided to strap it to my waist." Afterward, Bergman said he was glad he brought the camera. It's safe to say the rest of us are, too.